Another plush toy based on the Linux penguin “Tux”. This one is Harry Potter themed: a broomball wizard. 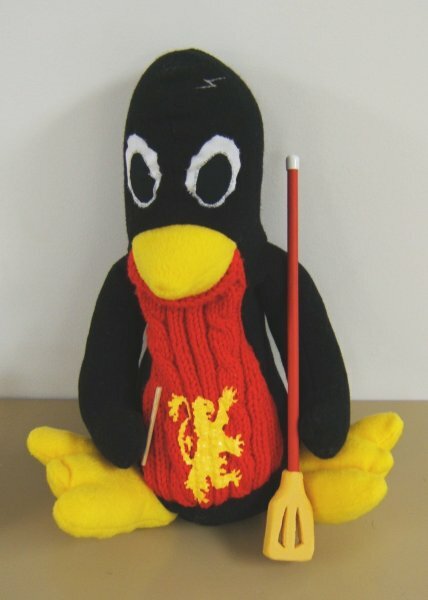 There are small but strong magnets in the toy’s hands, allowing it to hold the wooden wand and the broomstick. There’s also a small “vest pocket” that the wand fits into. A lightning-bolt scar is stitched into the forehead, and the toy is rather skinny compared to the original pattern (at http://www.free-penguin.org). The broom is made from light steel tubing with a foam-rubber “paddle”. The red sweater is part of the toy rather than being removable, and the gold/yellow lion decoration is fabric paint. There were a lot of technical problems that I wasn’t expecting. I’d never done appliqué before (the eyes), and had a lot of trouble with the material bunching up. Part of the problem was due to the stretchy base fabric, and part to the lightweight fabric used for the eyes. I painted the light fabric with a starch solution, which stiffened it enough to work with, but I probably should have used a more rigid fabric layer and simply accepted that the result would be less soft. The sweater was cut from a baby sweater that I bought at the Salvation Army store. I’d intended to stitch the lion onto/into it, as the Gryffindor lion was described as being part of the pattern of Harry Potter’s sweater, but I spent several days trying unsuccessfully to get it to work out with cross-stitch, sewing-machine satin stitch, and regular embroidery. The basic problem was that the sweater material was stretchy and irregular in three dimensions; the lion partially covers sections of a twisted-cable pattern. I just couldn’t get the stitches to be positioned or sized consistently. Even when I gave up due to running out of time and used fabric paint, with a clear dot/block pattern matched against the stitches and overall cable pattern, the result was rather stretched vertically. Making the wooden wand such that it would be held with a magnet was a bit of a trick, figuratively and literally. 1/8” balsa wood, drilled from each end with a 1/32” drill bit, repeat a couple of dozen times until — for once — both of the two holes are well-centered enough to meet in the middle, rather than one going at a slight angle and coming out the side of the stick. Slide in a sewing needle, seal the holes with a mixture of sawdust and glue, let dry, then varnish. I donated the penguin to the Interfilk charity auction at the OVFF filk convention. See also: Txulhu, Centauri Emperor Penguin, Tuxbert, Barrayaran Emperor Penguin, Open Source B**b Project, Bert Worcester, Pi Cop. jpolowinXYZZY@sympatico.ca but remove the XYZZY - it's a little magic to baffle the spambots.